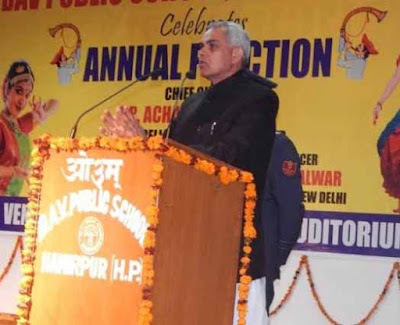 Hamirpur : Himachal Pradesh Governor Acharya Devvrat called upon the young children and youth to take up the responsibility of educating the society about environment protection. He was speaking at the Annual Function of DAV School at Slasi in district Hamirpur today. Governor said that global warming was posing a serious challenge and effective steps should be taken to protect the precious environment which sustained human life. He said that man was dependent upon nature for every need and added that every citizen should contribute towards this important cause. He said that initiatives should be taken at community and individual level to save the earth and ecology and added that mass awareness programmes were needed to make every person aware. Acharya Devvrat said that the beauty of 'Devbhoomi' could be enhanced by keeping the surroundings clean and underlined the need for aggressive cleanliness campaigns. He said that children should be sensitised about this issue in schools and suggested that schools also could undertake cleanliness campaigns inside the campuses and in vicinity which would not only make children cleanliness conscious but also inspire the people to do the same. He said that clean and green state would attract more tourists to the state and boost the tourism sector also to a great extent. He said that the goal of education should be developing sensitive and aware human beings with human values of compassion and kindness and added that mere knowledge of few subjects of curriculum was not adequate to achieve the real objective. He said that unless children grew into nation loving citizens, understood the values of patriotism, the country would not progress in right direction. He said that the future of the country rested on the shoulders of youth who should associate themselves with mainstream activities, come forward to work for betterment of society, eradicating social evils and help the under-priviliged and needy persons.